It’s been about 7 months since Ontario’s coroner announced that it was going to review cycling deaths in Ontario, on October 24th, 2011 Chief Coroner Andrew McCallum announced that he be investigating cycling deaths over the last 4 years in Ontario. That report was released this week, Office for the Chief Coroner for Ontario: Cycling Death Review – A Review of All Accidental Cycling Deaths in Ontario from January 2006 to December 31st, 2010. Today I had a chance to sit down and go through the report in detail. The findings are not surprising, there need to be some changes and enhancements to the infrastructure, education, legislation and enforcement. 129 deaths reviewed in total. 111 male, 18 female. Only 26% of those killed were wearing helmets! 56% of those <18 were not wearing a helmet at the time of their accident (it’s illegal under the age of 18 to not wear a helmet). 55% of resulting deaths were due to head injuries. 24% of Canadians are obese, 2/3rds of us are inactive! In 71% of the deaths there was a modifiable behaviour by the cyclist contributing to the death. The recommendations presented speak to the data collected. Each file was manually reviewed and 77 data points were captured. The review team developed a project charter with a mission statement, a scope and 5 hypotheses. The hypotheses shaped the focus and direction of the report. Each of the 129 files manually reviewed had 77 data points recorded, all of which were scoped from the 5 hypotheses. Cycling deaths are more likely to occur during the spring and summer months: This hypothesis was confirmed; three-quarters of fatal cycling collisions occurred from April to September. Cycling deaths are more likely to occur in those not wearing helmets: Our data showed the rate of helmet use to be very low – only 26 percent of those cyclists killed during the Review period were wearing a helmet. Those cyclists whose cause of death included a head injury were three times more likely to not be wearing a helmet compared to those who died of other injuries. Cycling deaths are more likely to occur when the cyclist and/or driver involved in a collision with a cyclist is using a mobile entertainment/communication device: Our data were not conclusive enough to confirm this hypothesis, as this information was not captured reliably in all cases. However, we did identify 21 cases in which either the cyclist or the driver were engaged in distracting activities that were felt to have contributed to the collision. In ten of these, the cyclist was wearing headphones attached to a mobile entertainment device. Cycling deaths are more likely to occur when one or more persons involved in the collision are under the influence of alcohol and/or drugs: Again, the nature of our data was such that we were not able to make a definitive statement about the rate of alcohol and/or drug use among drivers involved in fatal cycling collisions. Despite this limitation, we identified 30 cyclists and 10 drivers who were under the influence of alcohol and/or drugs at the time of the collision; the number of the number of individuals under the influence of alcohol and/or drugs is likely significantly under-represented in our data. The prevalence of alcohol and/or drug use while cycling in our Review is significant, and supports the need for targeted public education as noted above. The vast majority of cycling deaths are preventable: This hypothesis was strongly supported by our data. In virtually every case, some modifiable action(s) on the part of the cyclist, driver, or both, contributed to the death. Uncontrollable factors, such as weather and road conditions, rarely contributed to the death. In three cases the exact circumstances were not known, so it was not possible to determine with certainty whether the factors which contributed to the collision were related to the cyclist, the driver or both. However, our data support the conclusion that all of the 129 deaths in this Review could have been prevented. In total there were 14 recommendations made to various Ministries in Ontario, to the Municipalities and to Transport Canada. A detailed description of the 14 recommendations can be found in the full report under the categories of infrastructure, education, legislation and enforcement. Adoption of a “complete streets’ approach – focused on the safety of all road users – to guide the redevelopment of existing communities and the design of new communities throughout Ontario. Development of an Ontario Cycling Plan to guide the development of policy, legislation and regulations and the commitment of infrastructure funding to support cycling in Ontario. A comprehensive cycling safety public awareness and education strategy, starting in public schools, and continuing through the purchase of every new and used bicycle and through driver’s license testing. Legislative change (Highway Traffic Act (HTA); Municipal Act; relevant Municipal By-Laws) aimed at ensuring clarity and consistency regarding interactions between cyclists and other road users. Strategies to promote and support helmet use for cyclists of all ages. Implementation of mandatory helmet legislation for cyclists of all ages, within the context of an evaluation of the impact of this legislation on cycling activity. 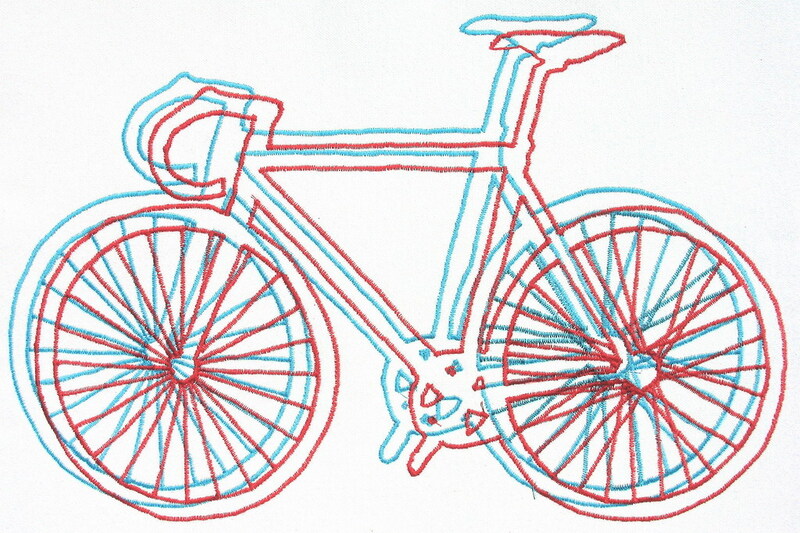 Establishment of a “one-meter’ rule for vehicles when passing cyclists. Prioritizing the development of paved shoulders on provincial highways. Mandatory side-guards for heavy trucks. Enforcement, education and public safety activities targeted to the specific issues of cycling safety identified in a given community. On Wednesday this past week I headed to the University of Toronto’s Sustainability Symposium. The three presenters set the stage for the following days, collaborative workshop (unfortunately I had to work on Thursday!). The three speakers all spoke on the topic of sustainability, where we’ve come from and where we are. Why are companies moving toward a corporate sustainable strategy, because we demand it! It’s not that it decreases employee turnover, improves employee engagement, increases profits and/or lowers costs, that governments demand it but it increases brand reputation, which means more demand for your product. Having trouble getting your boss to buy into sustainability? Just like when you go to your boss with a problem make sure you have some viable solutions. When you go requesting to make sure company more sustainable, make sure you quantify it. Want to learn more about The New Sustainability Advantage check out Willard’s website and book. Scale vs. Difference. Scale meaning size or dimension. Difference meaning dissimilarity. China vs. The United States. India vs Canada. Pakistan vs. England. 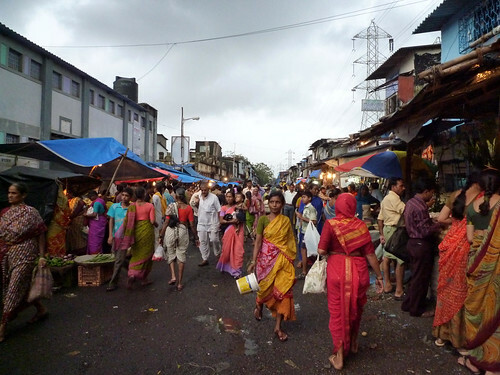 Where you may see congestion, people living on top of each other, mess, disorganization other see beauty, an ease to get everything they need, safe neighbourhoods. It’s a matter of perspective. This is where we live primarily. Yes Toronto, New York, London, Montreal, Boston, Chicago, Barcelona (that list goes on forever) has some really intensified, interactive neighbourhoods. But primarily we live the American Dream in suburban sprawl with larger houses with property, we drive to the grocery store and then to the bank and then to the baker, the butcher, to soccer practice… we drive everywhere. If we want to see change with need to act. Society looks to governments for change. But governments are big and beaurocratic, they move slow. If you want significant change than inflict it from the bottom; sometimes it’s easier to ask for forgiveness rather than permission. “To count, differences must interact.’ – Richard Sennet. How and where you live is a matter of personal choice; you decide what’s most important. The University of British Columbia (UBC) campus sits at the south-western edge of Vancouver along the Pacific coast. Having visited recently I can tell you that it is a truly unique, magestic campus. Vancouver set the bar high for sustainability; it wants to be the most sustainable city in the world and UBC is helping them lead the way. UBC has a regenerative building; it gives back more to campus than it takes. They set ambiguous goals with specific, attainable deliverables. It also helps that BC has a carbon tax, $30/Tonne of CO2 as of July 1, 2012, that the Public Sector is expected to be carbon neutral and they have a green communities act. There is nothing like the sound of carbon fibre hitting the pavement. The hollow clunk as your bike and you go crashing down. Yesterday while out doing a training ride I was side swiped by a Toronto taxi driver. Considering what could have been I’m pretty much OK; few major bruises, maybe a small fracture in my wrist, bruised ego and an unfinished training ride! Few things I’ll admit to being my fault, actually just one fault. It was getting a bit late in the day to be riding where I was. I had wanted to do a 100-120km, 4hrs+ in the saddle. It’s been a bit of a brutal week for me so I needed to get some sleep and I needed some ‘me’ time on the bike. I was on my bike by 0730 am but in retrospect I should have left 90 minutes earlier. So at 1130 when I was heading west on Bloor towards the Kingsway after doing the Ellis Avenue Climb in High Park, Bloor was packed with pedestrians and drivers. I slowed down, was aware of the imminent dangers, did not weave between cars but was patient in the right hand lane between the parked cars and live left hand lane of traffic, but could not stop the inevitable from happening. 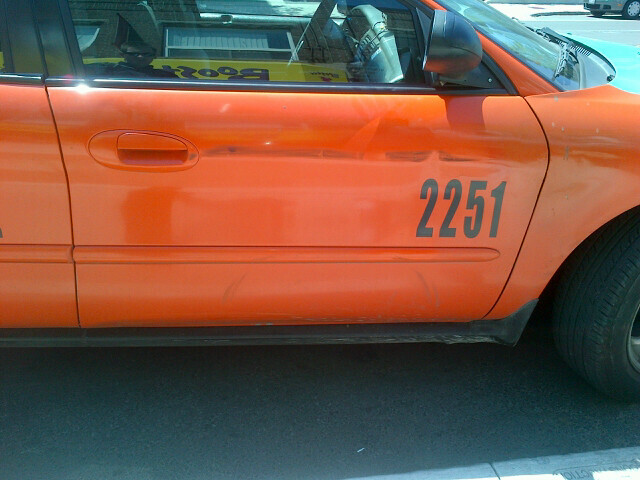 At 1130 yesterday a Beck Taxi veered into me. The driver was changing lanes to make a right hand turn to go north on Jane. Unfortunately the driver did not check his right side view mirror or his blind spot. Who knows what the driver was thinking as he changed lanes. As my mind went into panic mode I knew I had to make sure I was passed the last parked car as he was driving into me; being ‘squished’ between two cars was not an option. I knew I was going to hit the pavement. As the cab brushed up against me and my bike I managed to push myself away from the cab; I got my foot up against the door and forcefully pushed myself away. My bike was leaning to the right and I was afraid that as the bike hit the pavement I would be sucked under the cab. A crew of strangers picked me and my bike up off the pavement. I cried trying to catch my breath as I was thinking what could have been. 911 was called. Police and EMS arrived shortly. As did a fleet of Taxi drivers. I was very happy that the police arrived before the fleet of taxi drivers. Forms were processed, everything was documented. And as far as I know the driver was charged. Ride when the roads are quiet. Early mornings. In areas where there are low volumes of traffic, on paths or in parks where there are no cars. And ride with a friend. Texting and driving. As the law was tabled in Ontario the notion of banning all screens while driving was discussed. My dad suspects that the driver was looking at his screen for the next ‘pickup’; he did not have a passenger in the car. The Ontario rules state, “The new law will not affect mobile data terminals, logistical tracking devices and dispatching devices. They will be exempt for commercial and public service vehicle drivers who are engaged in the performance of their duties.” Drivers should be required to stop responsibly at the side of the road to use their GPS and communication systems, not while they are driving; they are equally distracted as a regular motorist. Always carry ID. I was wearing my pretty pink road ID and I had my cycling license in rear pocket. Carry something with your name and address on it. As well as something with emergency contact information. As a rider I know that I’m the most vulnerable. I never play games with cars; they always win even when they’re wrong. I really love riding my bike. I hate that I’m going to have to drive to ride now. I hate that I’m a statistic between bike and car. I’m not afraid to get back on my bike but I’m very afraid to ride near parked cars and live traffic. More people would ride more if cycling was Safer and there was more cycling Infrastructure (i.e bike lanes, shared lanes, etc). Some numbers from CAA: 60% of members and non-members from CAA want to see more cycling infrastructure in cities, 70% of Ontario’s population thinks more needs to be done for cycling (i.e. Share the road campaigns, safety, awareness, etc). Share the Road is asking the Ministry of Transportation (MTO) to dedicate $25M (1/8th of 1% of MTO’s budget) of their budget to cycling infrastructure. Cycling safety and an increase in infrastructure will only be improved through collaboration. Partnerships must be formed with municipal, provincial and federal governments. Governments must work together and not in silos; health care, transportation, planning, municipal housing and affairs, culture, tourism, etc. Partnerships must be made with the public and private sectors. I challenged the members of parliament on their current cycling strategy. A lot of the discussion on Wednesday circled around the ‘war on cars’. I know that it has been at the forefront of discussion in Toronto because of Mayor Ford. I challenged the MPPs to move away from the polarized discussion of cycling commuters and cars. I asked why cycling as a recreation was not a part of their discussion. I tabled my question stating that I was an engineer, an environmental planner, occasionally a cycling commuter but I was asking the question as a recreational cyclist. What I heard back. Recreational cycling used to be a part of the discussion, but cycling was not a popular sport at the time. The shift was then to commuters since they were the most visible. But no MPP answered the question! Share the Road Board Members and a few other key speakers really appreciated the question. The idea of bringing recreational cycling back into the conversation is on the horizon. Let’s see what happens next. Learn more about Share the Road and sign up for their newsletter here. Share the Road’s goal is to make Ontario more bicycle friendly for everyone by: Enhancing access for bicyclists on roads and trails, Improving safety for all bicyclists, and Educating citizens on the value and importance of safe bicycling for healthy lifestyles and communities. Share the Road represents all cyclists – children, tourists, commuters, recreational riders, mountain bikers and racers. I had a great time at #OBS2012 and look forward to attending again next year. If you have any other questions about the conference send me an email and I’d be happy to try and answer your question. This TED talk by Dan Pink is one of my favourites. It is one of my ‘go-tos’ to get motivated videos; The Surprising Science of Motivation. Or watch a slightly different version on the Royal Society for the encouragement of Arts, Manufactures and Commerce, Drive (also the title of Pink’s book). Forget the traditional thinking, rewarding people for the work they do. The science, the facts, demonstrate this funky inverse relationship, the more you reward people the lower the performance in return. What?! You mean you’re not going to reward me for working hard? No, that’s not what Pink is arguing. Pink and the research he has done argue that you have to pay people fairly, ‘take money off the table.’ Ever heard of ROWE? Results Only Work Environment. Not being monitored for the hours you sit at your desk (you know those idle hours where you wonder what you’re going to do since you’ve read every headline, every magazine and every tweet you can imagine! ), but instead being paid for the results you produce. Technology has changed everything, who needs to be in a desk all day to be effective. More importantly what a great way to kill creativity; force people to sit at a desk until they feel suffocated. Not sure ROWE is effective? Encarta vs Wikipedia. Managed, micromanaged vs created for free. We all want to be our own bosses these days. We want control. We want to do things when we want to do them. We do not want to be told when to arrive, when to go home, when to eat lunch. Technology makes that possible. Bureaucratic, conservative institutions make it impossible. Give a deadline, demand the results, expect the unexpected and allow a little flexibility and freedom. Something that matters. Matters to me? No, what matters to you. For self-direction and creativity it has to be important to you. It’s why there are so many people who practice a musical instruments. It’s why there has been a rise in masters level sports and intramural sports. It is your desire to be the best you can be at something you think is important… It’s why I ride my bike at 5:40am with a giant group of enthusiastic riders. It is the birth of creativity. It is the desire for all of us to do something that is important to us. And do we need monetary reward? Not necessarily. Recognition is often enough. Ok it would be pretty cool to be like a Steve Jobs, a Warren Buffet, a Bill Gates, but for the majority of the planet we will have to settle for something a little less. Although you can argue they did what they did in the service of us, in the service of something larger than themselves. And working for someone doesn’t mean you have to be unhappy. Ski Coaching brings me some of the greatest rewards in life; being out on the slopes with the under-11 athletes, watching the engage, learn, ski better, ski faster. There is no where else I would rather be on a wintery weekend morning than on the snow. I am part of the growth and development of the young ones; something larger than myself. What brings me purpose and fulfillment in life may not be for you. You may find purpose in developing policies that protect the citizens around you or in building something that makes ones life easier or in developing something to bring enjoyment to others. What drives each and everyone of us to be part of something larger than ourselves is completely individual. Can we compare to 3 Pillars of sustainability, People, Plant, Profit to Autonomy, Mastery and Purpose? My sustainable brain light bulb turned on after watching these videos again. How does Autonomy, Mastery and Purpose relate to People, Planet and Profits? People: It is easy enough to see that most people want a life of fulfillment, they want some form of Autonomy, Mastery and Purpose. To do something larger than yourself? Protecting the planet for future generations is definitely outside the scope of oneself. Planet: Protect the planet. Do it more efficiently. Do it with fewer resources. Do something that leaves a smaller footprint. I can see how purpose ties in here. And mastery, the idea of being able to do what we have done before with a smaller impact. You will need several masters to tackle this art! Profit: Efficiency. People want autonomy, people want to be paid fairly, people want self-satisfaction from their jobs. Pay the right person for the result you are trying to achieve. Hire someone for their skills (mastery), because they are passionate about what they do (purpose) and let them achieve that result, whatever path they chose to follow (autonomy). You would be surprised at the efficiencies. It might mean less office space, less wasted time, a different product (good or service) that meets your goal or objective. Lululemon prints their manifesto on the bags they sell their products in. It is a collection of slogans, sayings and words that Lululemon believes in. “Creativity is maximized when you’re living in the moment.” To live each moment to it’s maximum potential one needs a life of autonomy, mastery and purpose. Not always, just sometimes. Mostly at busy intersections where it feels like buses, cars and motorbikes are standing on top of each other. Sometimes on stretches where the road is so bad I’d rather bounce off every sidewalk joint. Sometimes in areas where drivers are so unaware I’d rather not take my life into my own hands. And if I ride on the sidewalk I’m always respectful of pedestrians because on the sidewalk they are the priority. As with most of my blog posts I had an incident that sparked this conversation. 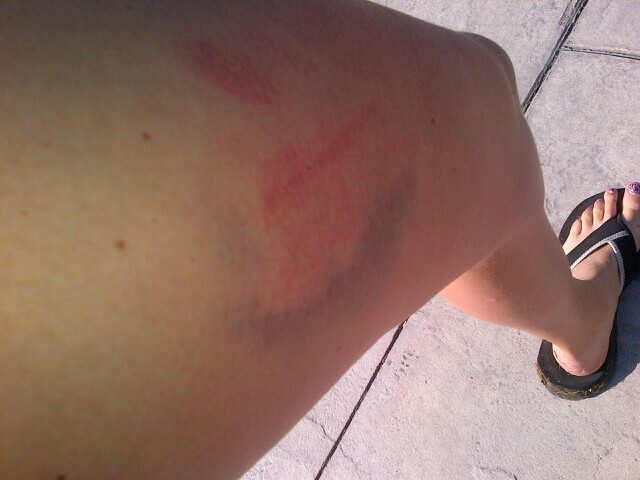 While riding to work yesterday I jumped on the sidewalk at the York Mills and Yonge Intersection. It is a busy intersection that has a subway/bus interchange to the east, to the north is the main highway corridor, Highway 401, and it’s at the bottom of a large valley. Add to that motorists and buses like to park in the westbound right hand turn lane to drop off and pick up passengers from the subway stop. As I approached the intersection a Canar bus was parked in the right hand turn lane. I had essentially come to a stop on my bike and was politely asking the passenger and driver if they could ‘excuse me’ and let me pass. The passenger boarded, the driver blocked the sidewalk to inform me that I wasn’t allowed on the sidewalk. Thanks but I’d rather not get squished by a car because your bus is blocking the intersection! Tristin Hopper confessed to doing the same in the National Posts Urban Scrawl: Confessions of a Sidewalk Cyclist. At least I’m not the only one! If there is a bike lane I’ll be in it. If the road is free and clear of cars and safe I’ll be on it. But sometimes I need to be on the sidewalk too. And when I’ve been on the sidewalk and seen the police no one has stopped me. In Toronto it is illegal to ride on the sidewalk if your wheels are greater than 61.5cm/24″. It costs you $110 if you get caught on the sidewalk or in a cross-walk. Don’t get caught!! Or ride respectfully and remember that the pedestrian has the right of way; slow down, make eye-contact, use a polite and respectful voice. For now I’ll practice safe-cycling! I’ll use bike lanes where they exist. Stay on the roads where it’s safe. And use the sidewalk as a last resort when I feel the situation is too high risk! Is it going to rain today? You can usually look outside and tell if it might rain. There is something about the air, it’s heavy, it’s moist, it almost feels electric. But will it rain tomorrow? The next day? How about a week from now? Our ability to predict the weather, actually our ability to predict almost anything long-term, is feeble at best. 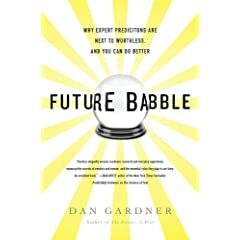 I just finished Dan Gardner’s Future Babble: Why Expert Predictions Fail – and Why We Believe Them Anyway and it was loaded with information and statistics about how our predictions about the stock market, housing values, human demographics … pretty much anything and everything, fail. Most of the time we would be as successful if we flipped a coin when making these decisions. Towards the end of the book Gardner starts discussing climate change, a favourite topic of mine. Gardner believes in climate change but he is skeptical of the climate models to forecast changes in our climate years, decades or centuries out. But even if science is underestimating climate change there are still some other benefits to doing projects that lower ones carbon footprint. Gardner argues the economics, social and environmental cost of carbon accounting schemes. ‘Carbon sequestration’ (pumping CO2 into the ground) will be a waste of money if our climate predictions do not pan out. But he argues the opposite case for methane capture off landfills – it’s win-win-win. Economically you make/save money by capturing a resource naturally emitted from a landfill. Socially, the harmful methane is captured from our atmosphere and has decreases our negative health impacts. And environmentally one reuses a gas that would otherwise be harmful to the atmosphere for electricity production. Carbon taxes actually have a similar effect, or they can. Raise the carbon tax and cut other taxes. Under this scheme one then also raises the “effective price of fossil fuels thus making alternative energy more competitive.’ Europe got it right. After the price crash of oil in the mid-80’s Europe decided to keep fuel prices artificially high with taxes. Thus research and development in conservation and alternative fuels continued. And what do we see today? Alternative energy in Europe is competitive, and they now rely on it and have to rely less on fossil fuels. I enjoyed Gardner’s book. At times it was a little overwhelming with the amount of data he presented debunking our science of predictions, but again that was the point. He wanted to hammer the point home that we cannot make predictions about our future. The future is chaotic, non-liner … unpredictable, and as a scientist/engineer I find that exciting. This summer I had an awesome time participating in the triathlon and duathlon series with MultiSport Canada, The Recharge with Milk Triathlon Series. I’m known as a ‘grazer,’ I eat several, small meals a day and I try to eat a variety of foods. From fruits and vegetables, to grains, proteins and fats I always make sure that I different foods to ensure I get all the vitamins and nutrients I need in my diet. I do have somewhat of a traditional meal habit. I will eat oatmeal or red river cereal for breakfast. At lunch I usually have a salad with protein. And dinner is fairly conventional, from meat, to fish, to pasta, whatever I may be craving or depending on how lazy I am! And while my main meals are well balanced it’s the snacking where I really get my balance of the vitamins and nutrients I need. During the day I usually have 1 morning snack and 2-3 afternoon snacks depending on my activity load that morning and night. Pick fruits and vegetables that are filled with water: The more water it contains the fuller you will feel; apples, oranges, watermelon, celery, cucumber, etc. Try and choose fruits and veggies that are in season and have a lower amount of sugar. And I usually try to pick fresh over dried. Have some yogurt and fruit: Calcium promotes strong bones. Yogurt is an excellent way to get a quick boost of calcium each day. Instead of buying pre-mixed yogurt full of sugar or aspartame choose a plain yogurt and add some fresh or frozen fruit. If it is still not sweet enough for you add a dash of maple syrup! Make a smoothie: I have moved my magic bullet into the office kitchen. I keep the cups at home and everyday I fill them with what I want in my smoothie. My favourite smoothie these days is a banana, spinach, mint, vanilla almond milk and protein powder mix. SPINACH?!?! Try it sometime. Once minced up in your smoothie you do not notice the taste and you have added a full serving of green leafy vegetables to your day. I keep other ‘snacks’ in my office in case of hunger attack emergency. In my snack drawer you’ll find a box of Kellogg’s Mini-Wheats, some sesame snaps and granola bars. I know that if I run out of my ‘fresher’ snacks from the day that I have some backup. And while my calorie intake is probably higher than the average person I know that I also burn more calories than the average person. Weight gain or loss is simple, it depends on the amount of calories from food in and amount of calories burned throughout the day out. Therefore the more you exercise, the more calories you burn, the more calories you will need to intake. BUT, it’s about making responsible choices for those calories you consume. I posted a new recipe this morning for Kale Chips. They are light, crispy and salty, just like regular chips, but they have way less fat, fewer calories and you can make whatever flavour you like! Posted: October 19th, 2011 under Diet, food, health. I’ll admit it, I’m a giant nerd. Last night I actually recorded and then watched the Ontario provincial debates with intent! While doing a bit of yoga I watched the McGuinty, Horwath and Hudak square off against each other. But all I could think was..
Who actually won the debate? Unfortunately politics, at least what I’ve seen as of late, in Canada (recent Federal and Toronto Mayoral elections) is about attacking your opponents instead of announcing your platform. And when we do hear about parties platforms, we hear about outlandish claims to make the city, province, country, etc a better place. But have any of these candidates actually considered the consequences of their promises on the budget? Where promises meet reality, reality bites! Here is a bit of reality (well at least in my opinion). Costs for education, transportation, health care, etc. are rising. Costs are increasing at a rate greater than what our tax system can manage. Instead of looking at reality (i.e paying more taxes) candidates make promises for more services with less taxes. That equation just doesn’t add up! We already have a tiered income tax tariff, why not introduce a similar program for other sectors? The objective is tiered system is not to benefit the low income earners. Having said that the objective is also not to punish the high income earners either. Energy: What about increasing taxes on increasing consumption? For the first ‘x’ number of watts there is no tax, the next ‘y’ units consumed are charged the HST, and above ‘z’ units consumption is charged an extra nominal tax. Consumption blocks would have to be broken up for residential and commercial. But this does a few things. First of all it promotes everyone to conserve, to consider the environment, you pay no tax if you’re a low consumer. Secondly it’s fair; it does not discriminate between high- and low-earners, each consumer is considered the same. And finally it would likely benefit the low-income earners. Typically they own small residential units , do not own a bunch of ‘energy-sucking gadgets’ that do not consume a lot of power. Seems pretty win-win-win to me, but I do understand the policy implications and the difficulty in setting up such a program. Education: We are so fortunate for everyone to have access to great education in Ontario. I am a product of the public school system and loved every minute I spent there. From my classes (nerd coming out again) to the athletics to the organizations I was involved in; I was incredibly fortunate. I do not want to see that slip away for future generations. Keep those teachers that love what they do. I’ve never really thought about how to ‘tier’ education… I think that will be the thoughts of my run today. Health Care: It’s a bit of a ‘can of worms’ when you discuss health care. It comes down to essential services and necessities; there is a lot of abuse in the health care system. I have no problem with 6-figure administrative salaries; all competitive CEO’s are paid these salaries and I want the best and brightest to be running the hospital I visit. Administration is needed; how else do you bring those essential services to the patients? Trust me the doctors are too busy to take care of all the administration and I’d rather have that amazing doctor working on me and other patients than pushing paper. Of course there is no easy answer. Many countries, who previously had a completely publicly funded health care system, are now privatizing some costs. Given that Ontario has the largest population in Canada, I would like to see a trial with some of the current health care services (for instance MRI’s, CT scans, x-ray..). Transportation: Bring on the tolled highways. Not every lane, not every highway. HOT (high-occupancy-toll) lanes have proven successful. Congestion charging has proven successful. We have come to think that driving a car is a right, not a privilege. But to maintain that right we are going to have to pay the ‘actual’ cost to drive on our roads. Ok, these examples are my opinion and fairly volatile. With the right policy they can work. I’m not saying it’s a perfect solution, but under a Nash Equilibrium you’re always looking for the second best solution! Posted: September 28th, 2011 under Election, infrastructure, ontario. What is the ultimate, optimal diet? Paleo? Vegan? Vegetarian? Meat-etarian? Ok the meat-atarian one is a bit of a joke, but these days there are lots of ‘dieting’ options out there. But trying to decide which one is right for you can be difficult. I go by the ‘Sasha Diet,’ it is sustainable, affordable and most importantly delicious! What is the ‘sasha diet?’ It’s a mix of local foods, what’s affordable at the local grocery and convenience stores and what I feel like eating. It’s an attempt to eat a balanced diet of fats, proteins and carbohydrates and the essential nutrients and minerals. It’s not that I count my calories or scrutinize food for specific nutrients, but I figure if I eat a variety of foods I’ll be able to capture the essentials. Fish: I try and eat fish once a week. I’m always checking out what’s local and try to eat a variety of fish. One of my favourite things to do in the summer is go for sashimi, it’s light, refreshing and packed with protein. Nuts and Legumes: Snack on nuts instead of chips and candy. Make or buy your own dips; hummus, bean dips and bring some veggies along to snack away. I prefer to make my own dips, since you can eliminate the chemically preservatives, I make small batches or larger batches that I share with friends! Veggies and Fruit: I try and eat a variety of both each day. As much as possible I try to buy what is in season and local or local greenhouse. There are always exceptions, like bananas; you cannot exactly grow a banana in southern Ontario! I try and eat fresh fruit over dried fruit. The fresh fruit provides you with the added water and most of us do not drink enough water in a day. I’ve also heard that consuming fresh fruit over dried fruit makes you feel fuller. For those of you cutting calories fresh fruit is the way you should go; compare the calories on a cup of fresh vs. dried fruit and you’ll see why. Grains: while I try to minimize my bread consumption, you do need to eat some grains every day. I’ve recently started eating oatmeal, red river cereal and cream of wheat again. It’s a great start to the day or even try it as a snack. Add some nuts, raisins, dried fruit etc. And I always add a touch of maple syrup for some sweetness! When I do consume bread I try to pick breads packed with nuts and seeds over conventional white and whole wheat bread. Dairy: My favourite recovery snack is chocolate milk! I consume one to two glasses per day depending on the number and intensity of my workouts. I also try to consume some yogurt and fruit as my mid morning snack. Cheeses are not big on my list, not because I don’t like them, they don’t like me. Goat cheese seems to sit ok so I consume a lot of it, and it’s lower in fat than most cheeses. Water: Part of a healthy diet is to stay hydrated. Coffee and soft drinks don’t count, they’re laden with caffeine and can be high in calories. Fruit juice is ok, but try to pick the more natural ones with less sugar and less ‘fake’ stuff. Pick foods that are local. Pick foods that are bright colours. Eat a variety of different things. Shop the perimeter and avoid things that come in a cardboard box. It’s healthy and it’s sustainable. Pick foods that you like and that you’ll eat. Throwing out food is a waste of money and resources. My diet also includes a lot of physical activity. Compared to most people I do a lot (my Tuesday was an early morning 40k road ride and ultimate frisbee that evening!). I’ve been called everything from dedicated to crazy. While it is not necessary to workout as much as I do, I think part of a healthy diet is being active daily. As I continue with my blog I think I’ll add a page on recipes. Hopefully it will inspire you to make healthy choices each day. Check out today’s recipe Summer Spinach Salad.